Edinburgh Council and Essential Edinburgh are providing a big range of attractions in Princes Street throughout December – Ethical Christmas Market, cafes, Santa Grotto, Reindeer, … see also the map of attractions [pdf 830k]. 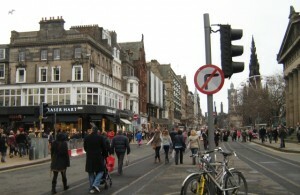 But surely the biggest attraction of all is that Princes Street is open to everyone and is traffic free! If cycling please still remember the tramlines – but even if you do fall over, you won’t be hit by a taxi [or a bus]! Some more bike parking would be nice too – at present many people have to use the Gardens railings. In January the tram works resume. Motor vehicles will still be banned but the wide traffic-free emergency/delivery lane next to the shopping pavement will return. In November it was used informally and successfully by many pedestrians and cyclists. Once Princes Street tram works are complete (July 2012?) 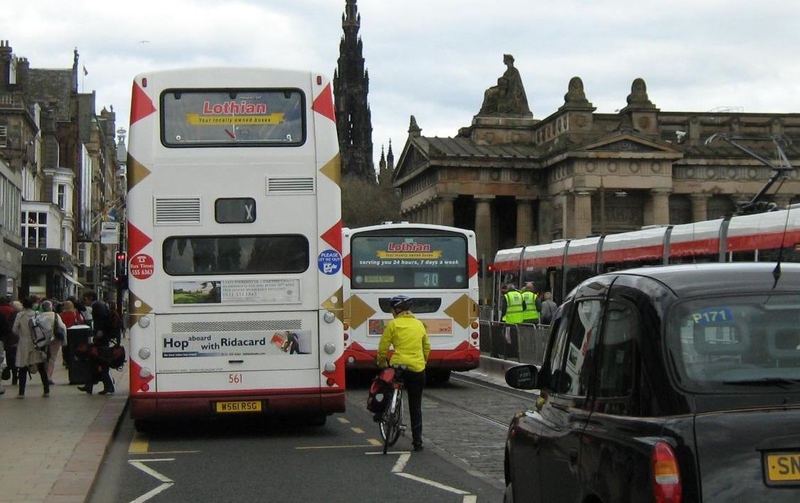 Princes Street will revert to the usual taxis, buses and cramped pavements. For the longer-term future Edinburgh Council is planning a consultation – this has been badly delayed due to the tram developments, and still no date is fixed. 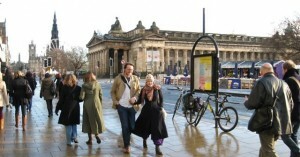 Spokes has long pressed for a traffic-free environment alongside the tram [Spokes 104 – pdf 2MB]. We wish to collect evidence on how well Princes Street works for pedestrians and cyclists in December; evidence we can use when the consultation eventually happens. Please send us photos showing Princes Street working well at a time when there are cyclists and lots of pedestrians – maybe best taken at the weekend. If possible put your photos on a website (for example www.flickr.com) and send us the link. If you send us actual photos please only send your 2 best photos, no larger than 1.5MB each (preferably smaller). Each photo must include at least one person using a bike. Only entries which follow these rules will be eligible for the prize (below). 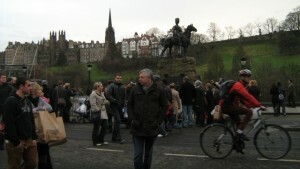 Send your website link or your 2 photos to spokesATspokes.org.uk, with the subject line PRINCES ST COMP. Closing date 31st December 2011. We may use any submitted photos (or links) on our website, in our bulletin, or in other ways, and the best photo will win one of the fantastic new Spokes Mapp Buffs. 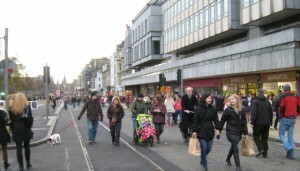 Back in 2009 Deputy Council Leader Steve Cardownie said our idea for trams, pedestrians and cyclists only in Princes Street would “allow us to compete with the likes of Paris, Barcelona and Prague. It’s a fantastic street – it would be absolutely splendid.” [EN 14.4.09, 23.4.09] [Spokes 104 – pdf 2MB]. Princes Street Traders‘ Rob Winter envisaged “a positive effect on the whole environment” and Visit Scotland says it would “help promote Edinburgh around the world” [EN 23.4.09]. A report to the Council in 2010 by renowned international architects Jan Gehl identified cycle and pedestrian priority as “essential” for Princes Street to achieve its “huge potential.” [See also Jan Gehl’s inspirational general document Our Cities Ourselves – download]. A compromise widely suggested is to have buses/taxis one-way in Princes Street and the other way in George Street. Also, either proposal could be trialled over say a year initially. 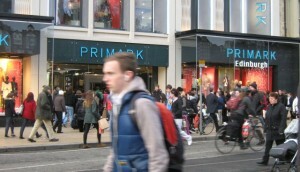 Unfortunately, since the above developments in 2009 and 2010, things have gone rather quiet in the council, presumably due mainly to the tram delays, but possibly in part to different views about what options should be consulted on – there seems to have been some dubiety in different parts of the council as to the eventual role of cycling in Princes Street, despite the very positive recommendations from Jan Gehl. Thus the present December unintentional traffic-free Princes Street experiment is really important – and hence our needs for pictures to show how it works.